It is interesting to discover that Rabbie Burns has another link to Portlethen, and although somewhat tenuous it’s worth noting here. 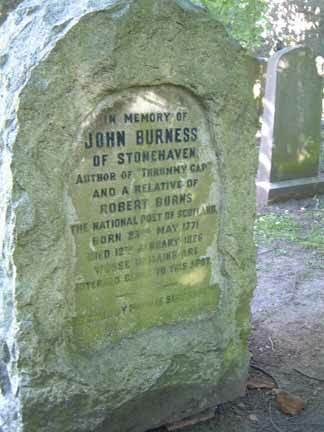 John Burness was a second cousin of the bard and a resident of Stonehaven. During his lifetime Burness was a baker and at various times served in the militia and it was during one of those periods of service that he embarked on a writing career. It would appear that he had something of his cousin’s literary talent for verse and he found some local fame, particularly with the poem Thrummy Cap, a light and humorous ghost story told in Scots verse. Will pack our awls an’ tak our way. Though we sude sit at your fireside. An’ siller plenty i’ my pouch? As lang as I’ve siller for to pay. But troth, ye’ll sit by the fire-side. Or else ye’ll maybe rue e’er day. So where’s the connection here with Portlethen? Unfortunately John Burness’ literary career never quite took off and, as he seemed unable to prosper as a baker, he eventually found employment canvassing for subscribers on behalf of a publishing company. It was during this calling that he perished in a snowstorm at a spot very near the church of Portlethen on the night of the 12th of January 1826. His body was found four days later by some farm servants who were clearing snow from the road. He was later interred in the Spital Cemetery in Aberdeen. It’s rather ironic that “Thrummy Cap” tells us of a cold winter’s night of snow, drifting and people looking for shelter from the storm and his own death is very nearly a mirror image of the circumstances which he wrote about in his poem. 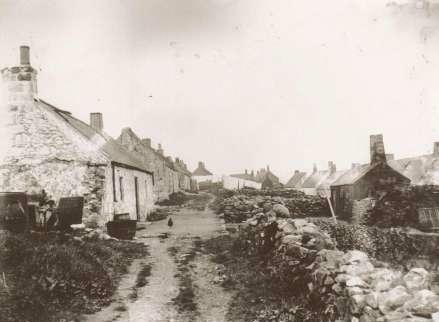 Did Burness find himself in a similar situation to those which he wrote and was forced to choose between sharing a room with a “frightful ghaist” or to take to the roads that were “sae blawn up wi’ snaw”? Who knows what location Burness had in mind when he originally wrote this verse however I like to think that the locale of Portlethen fits very well with the story and the fact that he met his demise in this area makes for a very credible, yet ironic, coincidence.